Rowley's Whiskey Forge: Whisky Advocate Runs Feature Story on White Whiskey by...Oh, Hey. Me. Whisky Advocate Runs Feature Story on White Whiskey by...Oh, Hey. Me. The current issue of Whisky Advocate magazine has a feature article on white whiskey by yours truly. [Edit 12/9/12: scroll down for a link to a PDF of the article.] White, light, unaged, minimally aged, and "raw" whiskeys are growing in popularity. Not everyone — including those who make it — agrees on what it is, so when editor Lew Bryson asked me to take a run at white whiskey, I made some phone calls, packed a sandwich, and hit the road to talk to distillers who make the stuff and drinkers who down it. As grain spirits come off the still, in- dustry insiders call the heady, limpid distillate new make or white dog. Every whiskey distiller in the world makes it and almost all of it is destined for barrels. Some, though, trickles out to the public. Lately, distillers and consumers alike have taken to calling it white whiskey. Marketers trumpet it as a hot new thing. In truth, the wheel has been around longer. And fire, of course. But new make was old hat when Johnnie Walker took his first wobbly steps. What is novel is that until about 2005, few dreamt a market still existed for the stuff. My travels brought me up the west coast of the United States. From tiny sheds up dirt roads to a distillery in an old Air Force hangar, I met with men and women making, selling, drinking, and mixing white whiskeys. 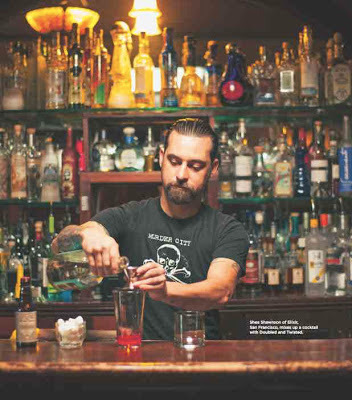 Bars and restaurants from New York to Seattle offer white whiskeys as a matter of course, even pride. White Manhattans and albino Old Fashioneds abound. If whiskey cocktails unblemished by oak are insufficiently exotic, trendy tipplers can ask for them “improved” 19th-century style with a few dashes of absinthe. Despite growing awareness and acceptance, the category is dogged by three recurrent questions. 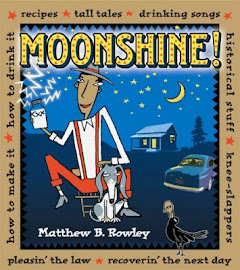 Two are worth addressing in passing: (1) Is white whiskey moonshine? and (2) Is it any good? I tackle those in about 500 words, but the third question, the one people should be asking and which fills the bulk of the article, is what do we do with it? Pick up the Winter 2012 issue of Whisky Advocate for some of the answers — including arguments that the way many white whiskeys are made is completely wrong — or download a PDF of It's a Nice Day for a White Whiskey here. Interviews, insight, and recipes from Thad Vogler of Bar Agricole and Shea Swanson of Elixir in San Francisco, Darek Bell of Corsair Artisan Distillery (and author of Alt Whiskeys), Jim Romdall of Vessel in Seattle, Ian and Devin Cain of American Craft Whiskey distillery, barber and distiller Salvatore Cimino, 13th generation master distiller Marko Karakasevic from Charbay, and, midwife to the modern tiki renaissance, Jeff "Beach Bum" Berry. Stir on ice. Strain. Garnish with grapefruit peel. Thanks for the article. I've an interest in white whiskies, and home maturation of same. In Virginia, I have access to the truly wonderful Wasmund's Single Malt Spirit, a new make malt whisky flavored with the smoke from apple wood and cherry wood.